This website might not function or display correctly as it is optimized for modern browsers. To get the best experience please use a modern browser. Paul Gray, Chief Executive of NHS Scotland and Director-General Health and Social Care, presents his Chief Executive’s Annual Report. He outlines the achievements made during 2017/18, and describes the challenging context in which NHS Scotland continues to operate. 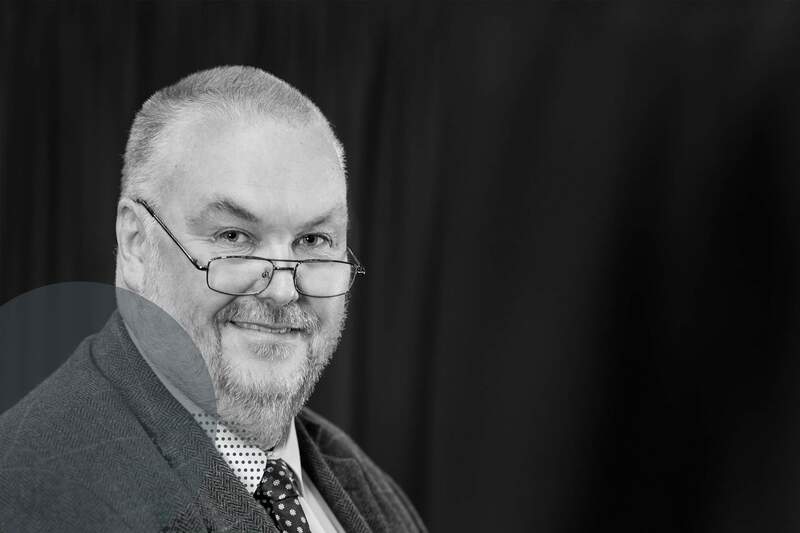 In his foreword, Paul pays tribute to the outstanding commitment of all NHS Scotland staff, and to the dedication of colleagues in our partner organisations – including those in the voluntary and third sector. The report charts progress towards our 2020 Vision for Health and Social Care and presents achievements in the three areas often referred to as the ‘Triple Aim’: improving the quality of the care we provide; improving the health of the population; and securing the value and financial sustainability of the health and care services we provide. Our Quality Ambitions for person-centred, safe and effective care have continued to guide our work in improving quality, transforming care and delivering improved performance. The video stories you see here are people’s personal accounts of NHS Scotland and its partners working to achieve the best health outcomes for the people of Scotland. If you would like to read more, you can access the full report below. The ‘What Matters To You?’ approach helps staff to focus on what’s important to the people they care for and support, and creates the right conditions for person-centred care. There’s growing recognition across the NHS of the importance of developing a family-friendly culture – one that encourages and supports people to remain connected with family and loved ones while they’re in hospital. In August 2017, NHS Grampian launched its ‘Welcoming Ward’ initiative. 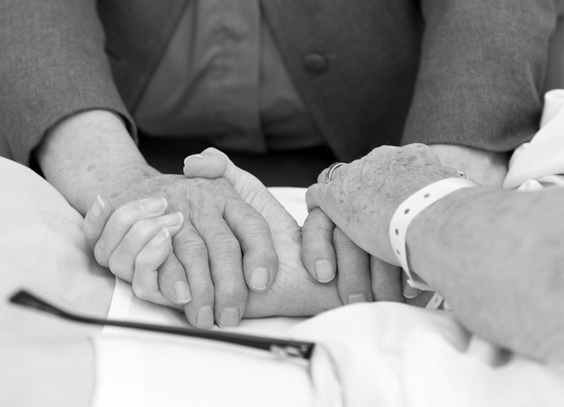 This person-centred approach to hospital visiting recognises the important role that families, carers and friends can have in a person’s recovery. By welcoming visitors right through the day, the initiative has achieved significant benefits at Aberdeen Royal Infirmary. It’s now being rolled out to all in-patient settings within NHS Grampian. Visitors who might otherwise struggle to attend due to other commitments are now able to come when they’re not in a hurry, and staff have more time and opportunity to discuss any relevant issues affecting their family members. Consultants and other staff have also been able to discuss levels of available care and the suitability of the home environment in much greater detail, and that’s helped inform decisions on when and how to send patients home. Hip fracture is the most common serious orthopaedic injury to affect older people, resulting in more than 6,000 admissions to hospital in Scotland each year. Caring for hip fracture patients involves a number of different disciplines in clinical and social care. Establishing an effective pathway of care for patients from arrival at A&E, through surgery and recovery to their return home, is critical. The important interventions along the pathway are measured against the eleven standards in the Scottish Standards of Care for Hip Fracture Patients. Anne is a fit and active retired teacher - and a keen curler until she slipped on the ice and needed a complete hip replacement. Anne was treated at the Royal Alexandra Hospital (RAH) in Paisley, where the team has a great record in orthopaedics. From A&E through surgery to physiotherapy and post-discharge care, the RAH demonstrated exceptional integration and cooperation between departments and services. The Paisley team has been recognised for their work, winning the ‘Golden Hip Award’ for overall performance twice in just three years. 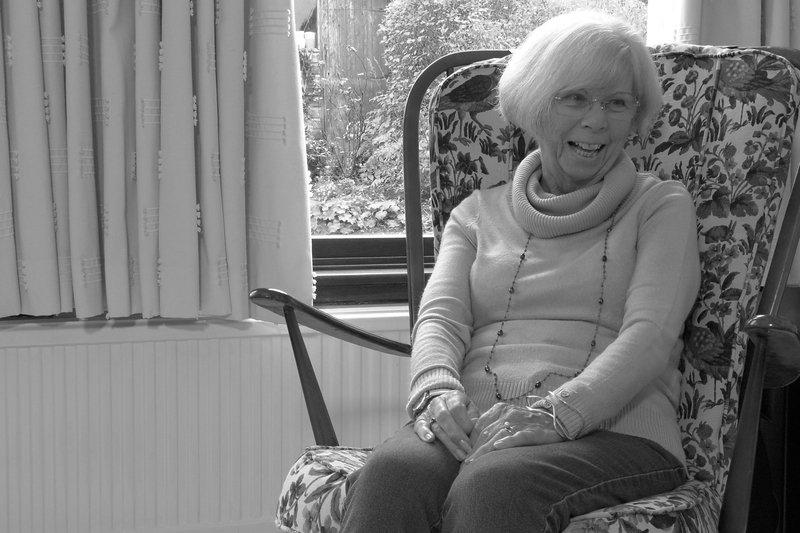 In our film, Anne describes how she was able to have surgery within 24 hours of admission, and began receiving physio treatment the following day. She was well and mobile enough to return home within a week. Many people who die by suicide have a history of psychological distress, experiencing anxiety, depression and other emotional and psychological symptoms. Supportive intervention at an appropriate point may help to alleviate distress and prevent self-harm and attempted suicide. A Distress Brief Intervention (DBI) is a supportive, problem-solving contact with an individual experiencing distress. DBI is a two-level approach, with DBI Level 1 normally provided by front-line staff including GPs, paramedics and police. Level 2 is provided by a range of third sector organisations and typically takes the form of community-based problem-solving and support. Since 2017, four pilot programmes in DBI have been underway in Scotland – in Aberdeen, Inverness, Lanarkshire and the Borders. An independent evaluation will report in 2021, but early observations show a high level of engagement and improved experience. DBI training has helped staff from the A&E department at University Hospital Hairmyres in South Lanarkshire to better support individuals who present in distress. Musculoskeletal (MSK) conditions range from minor sprains and sports injuries to serious and chronic conditions. 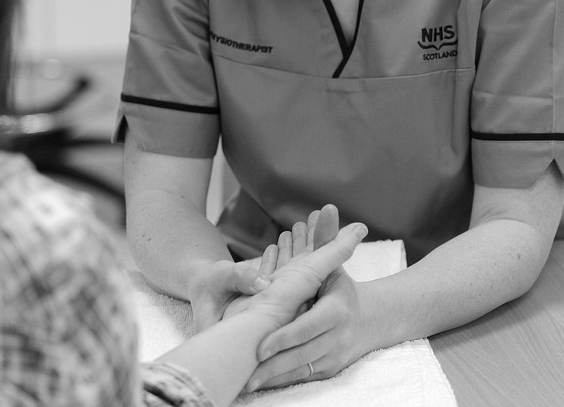 Across Ayrshire & Arran, within the first year of delivering a new service for people to be able to go direct to see a physiotherapist in a GP practice, it was found that the majority of MSK problems could be met by these physiotherapists. This was in nine practices across Ayrshire directly saving GP appointments enabling them to spend more time with other patients. This innovative model, and the success with which the team has integrated within the GP practices, has had significant impact on outcomes for patients in the test site areas. Practices with access to MSK physiotherapists have also benefitted from reduced GP workload, and referred significantly fewer patients for secondary care. Across the wider spectrum of conditions, advanced nurse practitioners can deal with many routine cases and help meet the increasing demands of an ageing population. The aim of this initiative was to ensure patients were seen at the right time, at the right place, and by the most appropriate professional. As well as providing an efficient and effective pathway for patients, the pilot aimed to support GPs in their day-to-day workload and limit referrals to secondary care MSK services. The Best Start: A Five-Year Forward Plan for Maternity and Neonatal Care in Scotland, describes a new and transformational model of maternity and neonatal services. It presents 76 recommendations to improve care and the experience of care for women, babies and families. Care and support for mothers and their babies has a significant impact on individual families and communities, and ultimately on society as a whole. 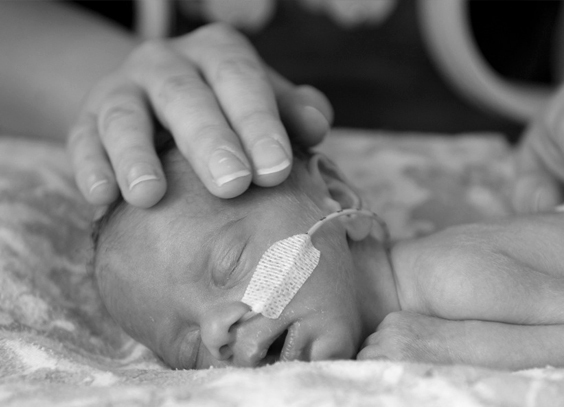 Evidence shows that the changes outlined in the report, could reduce rates of medical intervention and preterm birth, reduce length of stay in neonatal care, and provide safer care for even the smallest and most vulnerable babies. Improved support for mums and a focus on keeping mothers and babies together could also improve breastfeeding rates and deliver better clinical and social outcomes. One initiative that’s making a big difference is Continuity of Carer. This is the policy of making sure that, whenever possible, the family has the same midwife for antenatal care, birth, and postnatal care. Continuity of Carer can build supportive, relaxed relationships and deliver real benefits to mothers and babies. Digital video like Skype and FaceTime have transformed the way people communicate for work and pleasure, with real-time, face-to-face telephony connecting people all over the world. This technology also has great potential in healthcare. 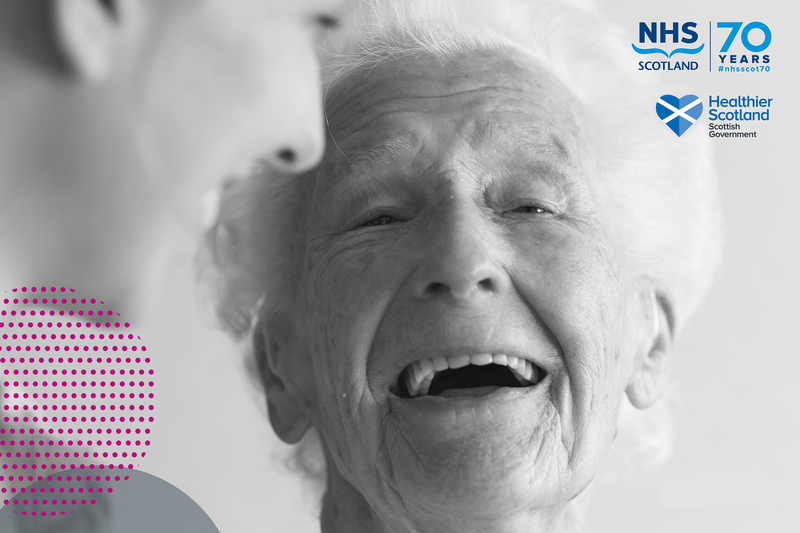 The Scottish Government’s world-leading Technology Enabled Care Programme uses this proven technology to accelerate the support given to people in managing their health and wellbeing at home and in the community. It’s now playing a key part in achieving the ambitions of the new Digital Health and Care Strategy. Attend Anywhere is a purpose-built system for the health and social care sectors. With Attend Anywhere you can have a GP appointment without leaving your home, or see a physiotherapist, specialist practitioner or consultant who might be hundreds of miles away. It cuts down on travel and disruption and improves access, especially in remote areas and for people with mobility issues. New digital technology can be challenging for some older patients who are otherwise most likely to benefit, and of course there’s still a role for the visiting health professional. 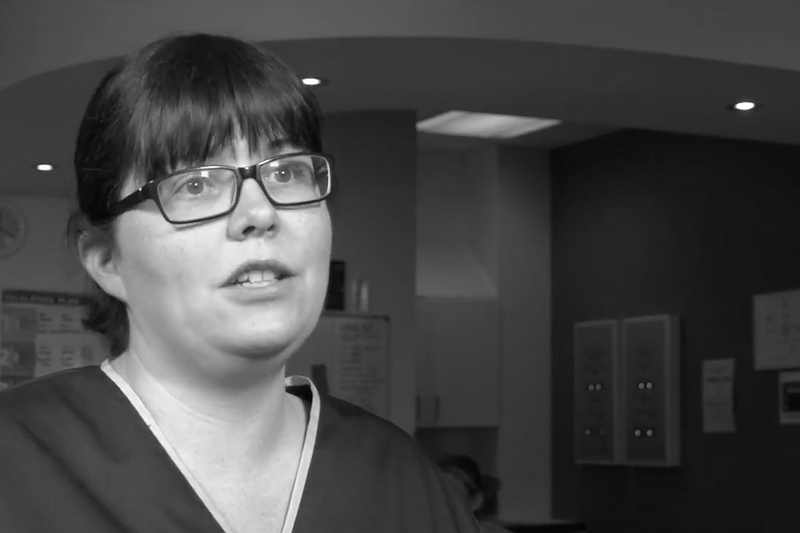 In our film from NHS Lanarkshire, Staff Nurse Lisa helps a patient link up with physiotherapy and occupational therapy practitioners through her iPad. Satisfaction with NHS Scotland amongst people who use its services is high. Our care experience surveys tell us about the quality of health and social care services from the perspective of those using them. We have set ourselves clear aims to ensure that there will be no avoidable injury or harm to people from the healthcare they receive, and that an appropriate, clean and safe environment will be provided for the delivery of healthcare services at all times. 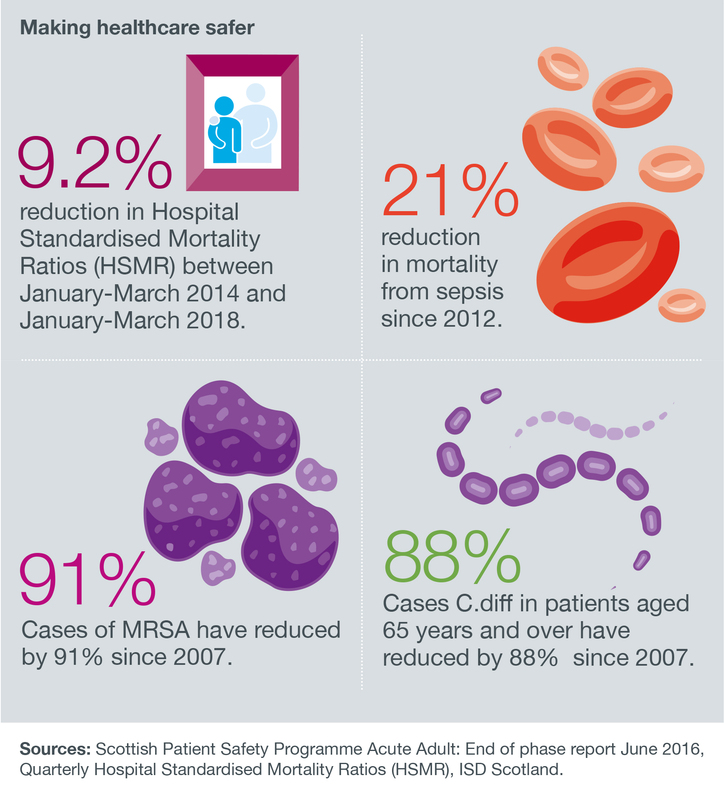 The internationally acclaimed Scottish Patient Safety Programme (SPSP) continues to drive improvements across a number of key areas of healthcare. This winter was a challenge for health and social care. 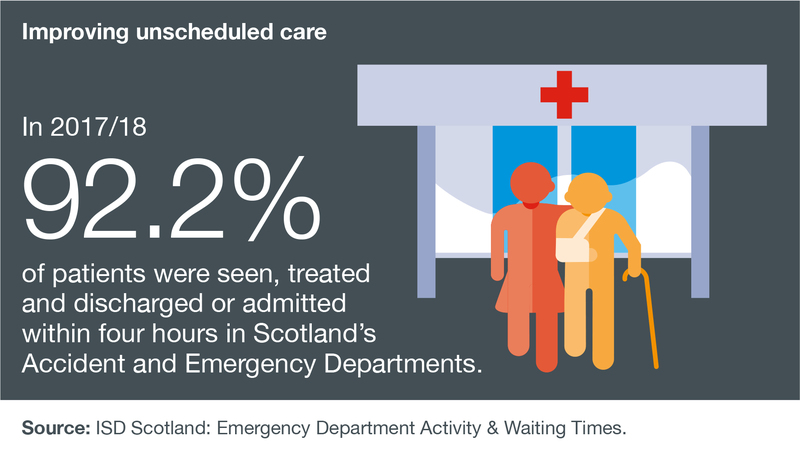 In 2017/18, 92.2 per cent of patients were seen, treated and discharged or admitted within four hours in Scotland’s A&E departments. Scotland continues to see the best A&E performance across the UK administrations – and has done so for more than three years. 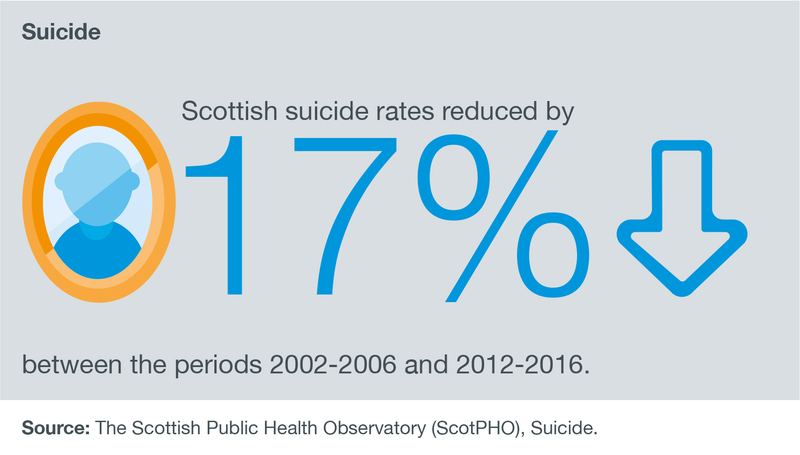 The Scottish suicide rate fell by 17 per cent between the periods 2002-2006 and 2012-2016. This time period includes the periods covered by the Scottish Government’s decade-long Choose Life strategy, which ran from 2002 to 2013, and the successor Suicide Prevention Strategy 2013-2016. Suicide rates were significantly higher in the most deprived areas of Scotland than the Scottish average, but this inequality gap has narrowed over recent years. 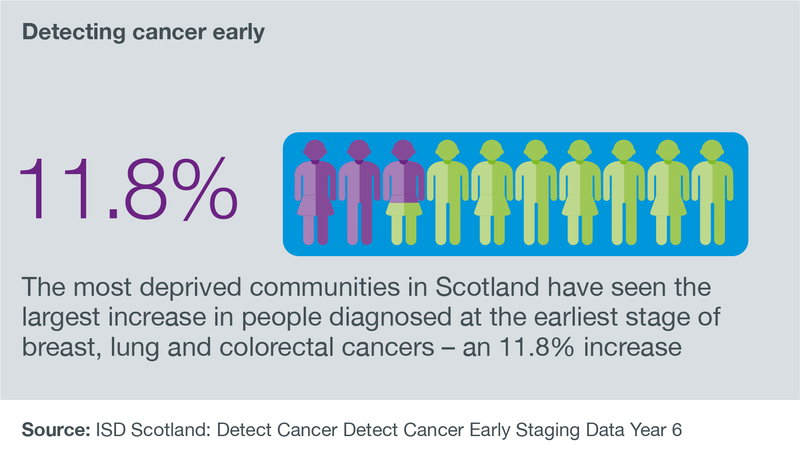 The most deprived communities in Scotland have seen the largest increase in people diagnosed at the earliest stage of breast, lung and colorectal cancers - an 11.8 per cent increase. For lung cancer specifically there has been a 31.0 per cent increase in stage 1 diagnoses in the most deprived areas since the Detect Cancer Early (DCE) Programme began in 2012. 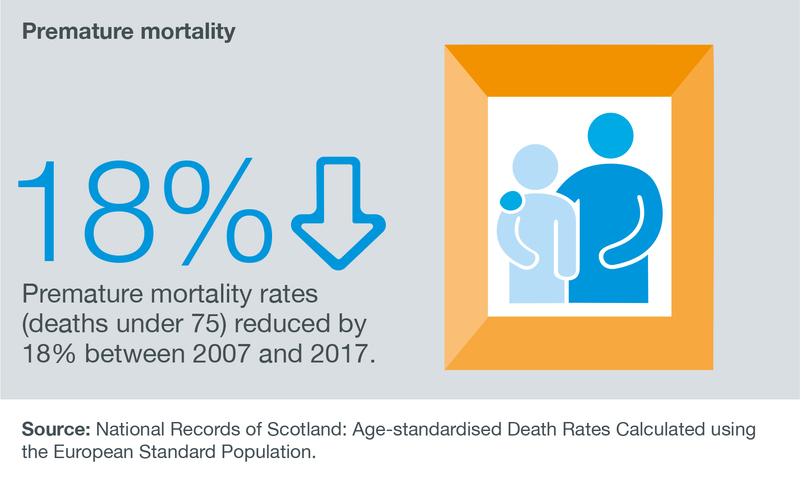 As a result of improved treatments and a greater focus on prevention, premature mortality (deaths among those aged under 75 years) has reduced substantially, down 18 per cent since 2007 to a death rate of 425.2 deaths per 100,000 population in 2017. The latest Scottish Health Survey reveals that smoking rates in Scotland continue to fall. Rates are falling faster in Scotland than anywhere else in the UK. The latest reported figures (for 2017) show that 18 per cent of adults smoke, down from 25 per cent in 2012. 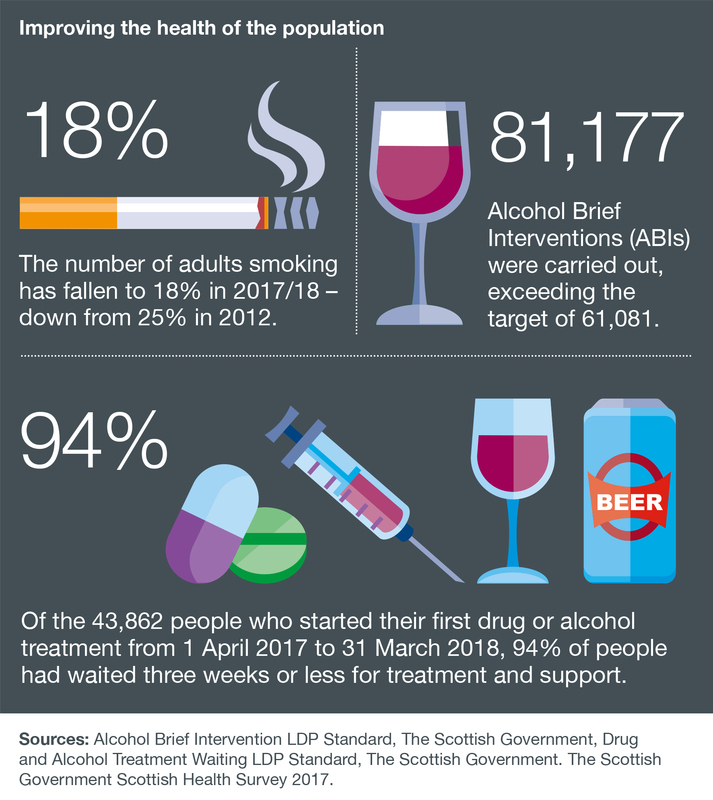 Scotland continues to be seen as a world-leader in addressing alcohol-related harm. During 2017/18, preparations began to implement the world’s first minimum unit price for alcohol, at a rate of 50 pence per unit, from 1 May 2018. 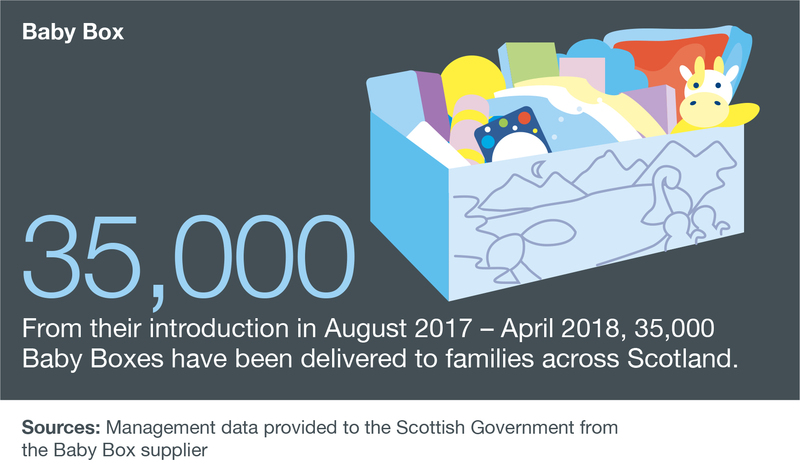 By April 2018, 35,000 Baby Boxes were delivered to families across Scotland, providing essential items for the first six months of a child’s life. Through early engagement with antenatal services as part of the registration process, the expectant parents were also introduced to a wide range of health promotion information. 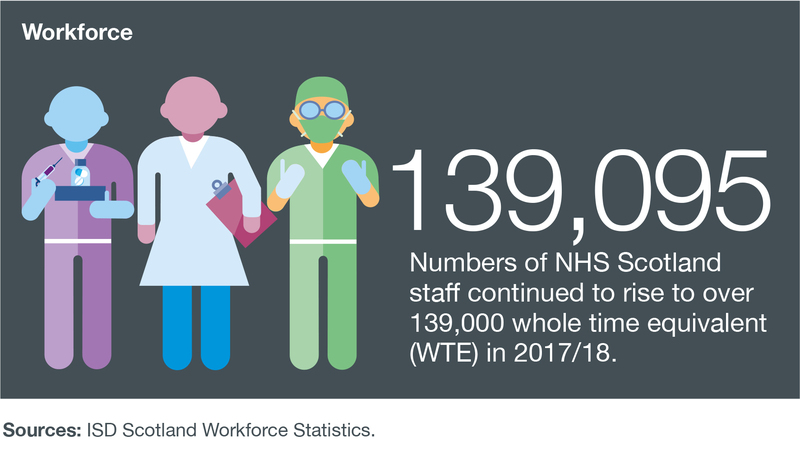 Our workforce is our greatest asset and is key to delivering modern, sustainable health services. NHS Scotland needs to have a committed, supported workforce that has the right skills, flexibility and support. Our 2020 Workforce Vision is that we will respond to the needs of the people we care for, adapt to new, improved ways of working, and work seamlessly with colleagues and partner organisations. 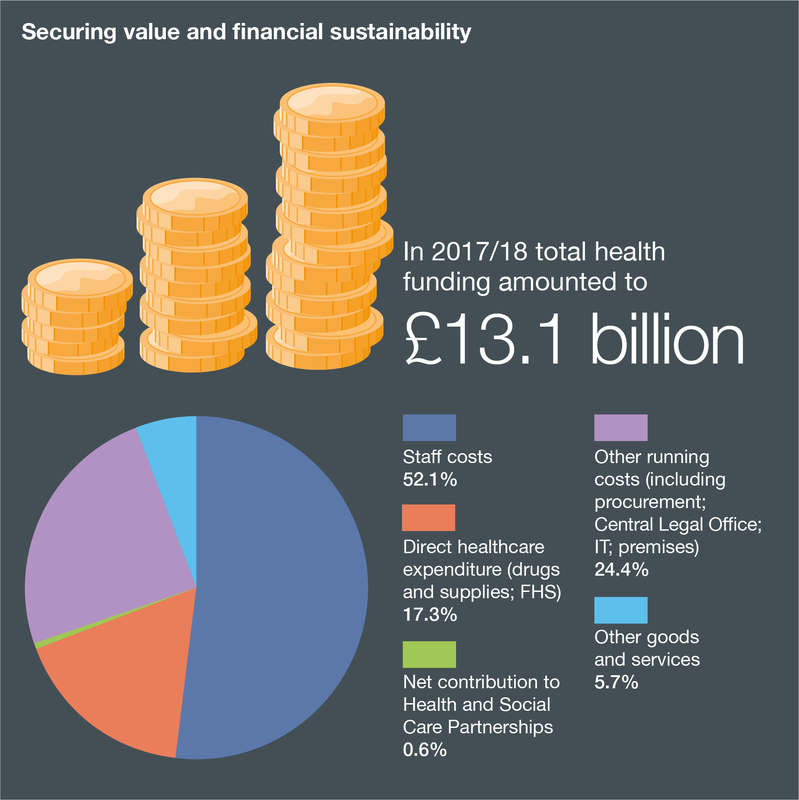 In 2017/18, total health funding amounted to £13.1 billion, with funding over the past decade having increased by 7.7 per cent in real terms. In 2017/18, additional investment in NHS Boards totalled £327 million, providing increased funding for territorial NHS Boards of 2.1 per cent and providing £128 million to support delivery of service reform. This funding also ensured that all territorial NHS Boards were brought within one per cent of their target funding allocations for the first time. In 2017/18, three NHS Boards required a two to three year timeframe to return to financial balance, and consequently required additional support in the form of brokerage. The total level of brokerage amounted to £50.7 million (0.4 per cent of the total health spend) and was managed within the overall health portfolio budget. The Scottish Government provided this funding to ensure that there was no impact on patient services, and in line with the overriding priority that patients continue to receive first-class care. In 2018/19, health funding has increased by 3.4 per cent (over £400 million) with total additional funding of 3.7 per cent for frontline NHS Boards. This additional funding was provided as part of the Scottish Government’s twin approach of investment and reform, recognising the increasing demand and expectations placed on frontline services, and being clear that the status quo is not an option. Funding has continued in order to shift the balance of care to mental health and to primary, community and social care. This will mean that for the first time ever, by 2021/22 more than half of frontline spending will be on community health services. Overall expenditure on mental health in 2017/18 exceeded £1 billion for the first time and this has been further increased in 2018/19 with additional investment of £17 million in mental health workforce and Child and Adolescent Mental Health Services (CAMHS). Spending on primary care has continued to increase as a proportion of the frontline NHS budget, with funding through the primary care fund increasing to £72 million in 2017/18 and to £110 million in 2018/19. This funding supports primary care transformation, and implementation in 2018/19 of the new GP Contract. The 31 Health and Social Care Partnerships, now in their second full year of operation, are critical to shifting the balance of care. In 2017/18, the 14 territorial NHS Boards delegated £5.5 billion of their budgets to the Health and Social Care Partnerships. Supported by £3.4 billion of delegated Local Authority budgets, pooled budgets of £8.9 billion were available across Scotland to deliver primary and community health services and social care. 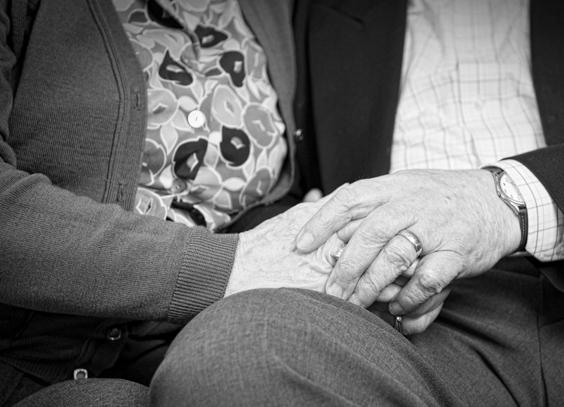 In 2017/18, the Scottish Government’s overall package of additional direct investment in social care and integration increased to over £550 million. This investment is enabling local partnerships to work together to make best use of their total resources and ensure people have access to the right care at the right time and in the right place. Capital investment in the NHS Scotland estate continued to be a key enabler of change and helped support the delivery of the National Clinical Strategy for Scotland with a number of new facilities being developed including the opening of the new Dumfries and Galloway Royal Infirmary and the new state-of-the-art Jack Copland Centre for the Scottish National Blood Transfusion Service. Further developments include the Stirling Health and Social Care Village due to complete later in 2018, and the new Balfour Hospital and Healthcare Facility in Orkney is ahead of schedule and is due to open in early 2019. The Scottish Government continues to work with NHS Boards to deliver savings to ensure that public money is being used effectively and for the benefit of patients, and that every penny of savings is reinvested directly into frontline services. The Sustainability and Value Programme Board was established in 2016/17 and continues to oversee initiatives undertaken by NHS Boards and their delivery partners to reform services. NHS Scotland is committed to supporting a culture of openness that welcomes feedback, comments, concerns and complaints, and uses them all as a source of intelligence to drive continuous improvement. NHS Scotland continued to engage with the independent website Care Opinion, which provides an online route for people to share their experiences of care – whether good or bad – and to use this to improve care. With over 12,000 stories now posted about people’s experience of care in Scotland, Care Opinion has become a valuable source of information about what really matters to people about health and social care services across Scotland, what they think works well and what could be better. There were 3,200 stories shared about health and social care services in Scotland during 2017/18 and these have been viewed more than 1.7 million times. Over 67 per cent of the stories were considered positive and 66 have led to changes to services being made or planned. Here are just some of the stories posted and some of the resulting actions taken. I would have liked to have been told what was going to happen in the unit when I arrived, who was going to see me, how long it would take etc., and kept informed at each stage which would have been put my mind at ease and helped me to relax. Your experience was shared with staff at our staff forum with a very positive response on how to avoid this situation to improve our patients’ experience at such an anxious time. Following discussion within the clinical team there have been a few changes identified that may help in this situation, which we will implement immediately. The worst part was having to carry my urine sample down the corridor in tears. I couldn’t believe the lack of privacy or compassion at this point. … your writing about the profound impact of having to carry your urine specimen up the corridor has made my staff and I reflect on the system of obtaining and testing urine samples for all patients. This is a step that can be made better by the process being re-designed. We have thought of a few ways to do this and we will be back in touch once we have started to test these. I would also have liked a more informative leaflet about my fracture because I didn't understand why I had to return in a week when I was in A & E but couldn't ask the questions wanted because the gas and air slightly jangled my thought processes! Thank you also for your suggestion about an information leaflet about fractures being handed out to patients in the Emergency Department. I will speak with colleagues in Orthopaedics about the possibility of producing this leaflet. Our 4 year old started fitting and was rushed in to the Borders General Hospital as an emergency. It was an extremely scary position for us to be in as parents seeing our young son fitting and displaying symptoms of meningitis but we felt reassured by the clinicians providing his care and were kept up to date as to the next steps in his care … staff were professional, friendly, informative, compassionate and reassuring, we have nothing but thanks and gratitude for you all. On walking into the ‘women’s and children’s’ unit the welcome desk was straight ahead and empty. We looked round and headed for maternity as there were no other signs with clear enough details of where we needed to be. I am so sorry to hear of your poor experience within our new hospital. I have asked that the staff put a temporary sign on the reception desk whilst we await the permanent improvements and I will enquire with the volunteer co-ordinator and administration manager as to how we can better ensure staff are available on reception. Attending an outpatient appointment at Victoria Hospital Kirkcaldy… I saw an older man with Down’s Syndrome and a lady also who has Down’s Syndrome. Both waited just as long as I did to be seen and feel reasonable adjustments should have been made to make their appointment waiting times shorter. No visible symbols or easy read materials anywhere. I just feel disappointed. Thank you for your feedback….. where we know of a patient with a specific need, we can make every effort to address that; however we need to be careful to treat each person as an individual. With regards your reference to visual symbols and easy read materials, we acknowledge your point and know we need to improve this. There is a lot of work going on within Learning Disabilities to produce information for patients/carers, so watch this space...we are happy to share when it is ready! Our son was admitted to intensive care after being found unconscious in his flat. He had multiple issues including kidney failure and compartment syndrome in his right leg. From the moment we arrived at the unit the staff were absolutely wonderful. They worked with great care and efficiency to first stabilize our son and then treat his physical injuries. Whilst doing this there was always an air of calm and professionalism and everyone took the time to keep us as his parents informed. We were in a state of shock and everyone treated us with great care and concern. My male partner, who is partially disabled having suffered numerous spinal fractures caused by osteoporosis and walks with a stick, attended an appointment to have his aneurism checked. The staff member who called him in reception had little or no people skills, nor even common courtesy for a patient. Her manner came across as bored and bordered on rude, to say the least. I was sorry to learn that your experience wasn’t a more pleasant and positive one for you both. I would like to give you reassurance that the concerns you raised about the attitude and behaviour of the staff will be discussed with those involved and additional training will be provided. I cannot thank them enough for supporting me to give birth without much pain relief and getting my son out safely and then explaining he was going to Neonatal. I had an excellent birthing experience at AMH and can't thank everyone enough! I would love to hear and see a more inspiring waiting area for appointments, to inspire patients and visitors that wearing a limb is something to be proud of and there are no limits on your life. Thank you very much for your posting your comments. I definitely think that this is something that we need to explore working in collaboration with patients and patient groups to capture these stories and promote and motivate others on how using a prosthesis may contribute and improve overall health and wellbeing. As the result of a fall, my wife had a full hip replacement. Prior to discharge from Wishaw General Hospital, the Occupational Health took great care to ensure that, at home our bed, toilet seat, various chairs all had appropriate temporary measures put in place … to ensure that the new hip would not be damaged or dislocate. On attending a follow up appointment at Outpatients, we were surprised to find that the fixed seating in the A & E waiting area, had very low fixed plastic seating without arms. I would have thought that a designated area of appropriate seating in the waiting area would have been provided. We have reviewed the seating within the Orthopaedic clinic and now have seats available to support patients who have undergone surgery similar to your wife. These seats are stored within the clinic and the reception staff are able to notify the staff within the clinic that seating is required. I had a baby in NICU in Wishaw General Hospital for 5 weeks. We had excellent care and were well looked after. The one issue I had was with wheelchairs. I was in the postnatal ward recovering from an emergency operation, and my baby was in intensive care. Due to the nature of my operation I couldn't always walk from one to another….. during visiting hours it was very difficult to find a wheelchair. I would like to see more wheelchairs available so that no-one else has to struggle with not being able to visit their baby. Thank you so much for your feedback. I was sorry to hear about your experiences of trying to find a wheelchair and how this delayed you being able to visit your baby in NICU. This is certainly an issue that I will follow up to try and avoid the same happening to other mothers.